If you are running a web service that is spread across multiple nodes on EC2, you should definitely setup some monitoring software as soon as possible. I like to use munin to monitor system-level performance metrics. Munin is easy to install, and it’s fairly easy to build your own plugins (in Python) to monitor any internal metrics (signups, logins, etc). Unfortunately, there are not a lot of good tutorials helping out beginners on how to install munin from scratch on multiple nodes. I am aiming to bridge that gap with this post. I am assuming you are running UBUNTU 14.04 LTS (installing 3rd party software using apt-get). It is also very important that port 4949 is open for TCP, as this is how munin-nodes talk to the munin server. This can be setup using EC2 security groups. Now that munin node is up and running, lets update the munin-node.conf on each of the machines. The munin-node.conf file needs to be configured to provide the name of the munin-node and the accepted ip-address(s) that are allowed talk to the munin-node process via TCP on port 4949 (default, but can be changed in this file). Here is an example of the munin-node.conf file (on UBUNTU, this file lives at /etc/munin/munin-node.conf). The the only 2 lines in this file that I needed to update were 36+37. Here is where I am telling munin-node that the name of this node (this will show up in the munin graphs) is database.mathandpencil.com and the node should accept all ip addresses. It is important to note I am accepting all IP address because I have my security groups / and fire walls configured so only other computers within my security group can talk to this node. You do not want to have TCP on 4949 open to the world. After you have updated munin-node.conf, you need to restart the process. Now you are done with this node. You need to do this on every node in your network, and you need to use unique host names for each node. Note, the host names do not have to actually have CNAMES associated with them, they are just for internal, munin usage. Now that you have the nodes configured, you need to setup a munin server, which will take all of the munin-node data, aggregate it in 5 minute intervals (via a cron job), and display it in a nice, graphical form. To do this you need to install NGINX to serve the static resoures + html, but first lets use telnet to make sure that your server can communicate with the nodes, as there will be no data to graph if it cannot. It is important that you can telnet into your munin-nodes FROM your munin server (the instance that shows the graphs). You should NOT be able to telnet from your munin-nodes into your server. It is only a one-way relationship. If you get a reply with the node-name, you are good to go. If you have issues, make sure port 4949 is configured for TCP correct. Lines 7-11 setup the munin graphs. 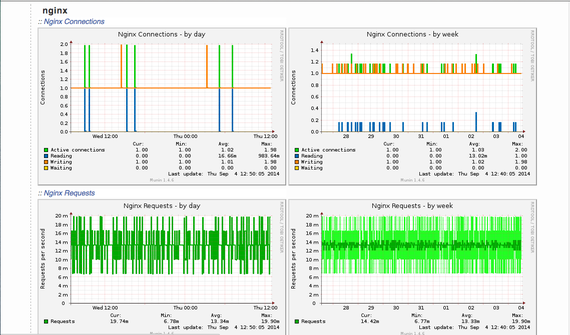 I like my munin graphs to live at http://www.mathandpencil.com/munin/, but it is up to you. Also, I recommend adding authenication to munin, as you do not want any bloak with internet access to see your web service metrics. Lines 14-17 are actually added so munin can monitor NGINX so if that is something you are interested in, you should definitely add those also. As you can see from the output, my cpu plugin is running just fine and returning values. To delete a plugin (and the graph), just simply delete the symlink and it will drop out next time the cron job runs.